Loretta Joyce Evans was born during the Great Depression to Lloyd Beecher Evans and Emma Evans in western Kansas, the oldest of their 3 children. Her sister Marilyn and bother Loren were very important in her life. Loretta graduated from Holyrood High School. After high school she attended Brown Mackie Business School. After graduation from business school, she married her high school sweetheart Melvin Keyser. Three children were born of this marriage, Rebecca, Nancy and Melanie. Melvin and Loretta later divorced. Loretta did not remarry. Loretta was always a hard worker. She had many jobs throughout her life, but was most proud of her position as the first female postmaster in Council Grove, in 1978. 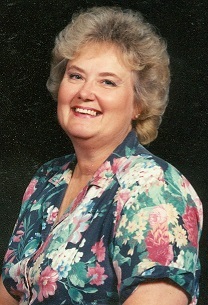 She retired from the Post Office, while still in her 50’s to enjoy her passions: travel, researching family history, volunteer work and grandchildren. Loretta valued education and encouraged her children and grandchildren to read and do well in school. She did not have the advantage of a family who could afford a college education, but she sacrificed to make sure her daughters were able to attend college. Faith was always an important aspect of Loretta’s life and after moving to Council Grove in the early 1960’s, she joined the United Methodist church, where she was active with the Methodist Women. As a result of her childhood in poverty, Loretta felt very strongly that those in misfortune deserve kindness and assistance. She was extremely active with Care and Share and special projects for her were making sure all area children had warm clothing, coats, hats, and mittens during the winter and that no child went without a Christmas present. Other volunteer organizations include big Sisters, United Way, United Methodist Church, Friends of the Kaw, Kansas Historical Society, and Library Board. Late in life Loretta suffered from dementia. This did not take away her love of family, being silly, or ice cream. Family was extremely important to Loretta. Loretta is survived by her sister Marilyn Frevert, brother Loren Evans and wife Barbara Ann, daughters Melanie Byram and husband Harry, Becky Wilson and husband Mark, and Nancy Shade and husband Bill; as well as 9 grandchildren Anneliese, Tyler, Mary, Jordon, Christine, Max, Hayley, Steven, and Caleb; and 8 great grandchildren Ada, Piper, Elmer, Daphne Loretta, Violet, Reese, Valancy, and Wally.